The general rule is that you can claim deductions for expenses your business incurs in the process of generating assessable income. 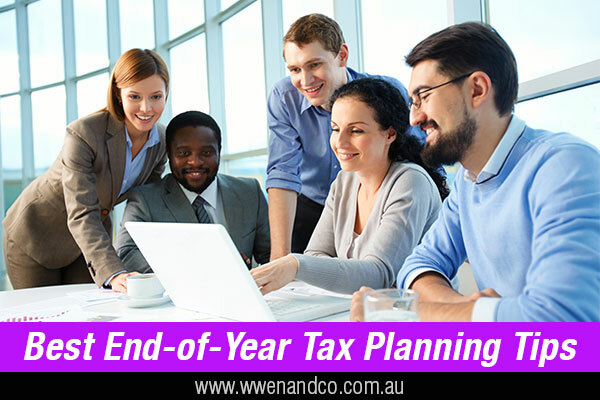 Many of these deductions are obvious – rent, materials, supplies and so on — but there are also some less obvious options left available just before the end of the income year, should your circumstances suit, to further reduce your enterprise’s tax burden for the year. If your business has taken out a loan, any interest accrued but not physically paid by June 30 is potentially deductible (the crucial factor, of course, is that the loan was used to produce assessable income, which most business loans are) — assuming that the business accounts for tax on an accruals basis. In a similar vein, see if you can negotiate with your finance provider to make upfront interest repayments — that is, they may not be “due” until after July 1, but the finance provider will accept them before that date. A sole trader’s business and nonbusiness activities are all dealt with under the taxpayer’s personal income for tax purposes. So qualifying business expenses will be deductible even if you used your personal credit card instead of your business one. Another common fact of business life is that some amounts owed to you sitting on the balance sheet are not likely to ever be paid. Now is the best time of year to re-consider these amounts, and decide if any are legitimate bad debts, and therefore able to be written off and be transformed into a tax deduction. To this end, it could pay you to go back through your outstanding invoices to find potential bad debt candidates and write them off before June 30. However, the ATO has rules regarding bad debt deductions — call our office for more details. However, if the sale will produce a capital gain, delay crystallising this gain until the 2017-18 income year so that you will have a full financial year to put in place options to offset that gain with capital losses or revenue expenses. It may even be worthwhile for you to sell an underperforming asset, and realise a loss, if this suits your capital gains tax circumstances. And remember, as a general rule the “CGT event” for a disposal occurs at contract date — this could help in your planning if you sell an asset where settlement and/or payment takes place in 2017-18 but the contract is executed in 2016-17. Taking into account the changed value of your trading stock over an income year can affect the resulting taxable income. But as you can have a choice of how that valuation is arrived at — that is, cost, market selling, or replacement value (or even a lower value due to obsolescence) — the end result may allow you to either bring forward deductions or alternatively increase taxable income if you have sufficient deductions to use up for the 2016-17 year. And remember, each item of trading stock can be valued differently for tax purposes. Ask for our help if you need guidance. Getting a tax deduction for the wear and tear and loss of value on business assets that are used to derive assessable income is a stalwart of the business tax regime, so a review of your enterprise’s depreciation schedule is always wise. Any number of opportunities can be discovered, including the ability to scrap and write-off amounts of redundant assets, reassess remaining effective lives, or allocate assets to a low-value pool. This is important for this and the next tax year as the $20,000 instant asset write-off has been extended until June 30, 2018 (subject to legislation passing). It will thereafter revert to $1,000 (notwithstanding possible further changes in next year’s Federal Budget). A company can also claim director bonuses in the year the expense is accrued in the same way (directors are classified as employees). For a company to claim a deduction for a director or employee bonus without physically paying the money, the company must, before the end of the financial year, commit to the payment of a specific amount. The amount need not be quantified but the calculation methodology must be fixed (for example, a formula based on profits or revenue amounts yet to be finalised). The commitment should be documented (such as minutes of a directors’ meeting). There may be a case to offset prior year losses against current year income, however for companies and trusts the ability to do so can be subject to certain conditions (the carry forward loss rules). These include the continuity of ownership test and the same business test for a company. And finally a reminder that the small business income tax offset rate for unincorporated enterprises for 2016-17 has gone up to 8%, and will stay at that rate until 2023-24. It will then double to 16% by 2026-27 (the offset will remain capped at $1,000 a year, however).